The EU outermost regions are natural reservoirs of the ocean industry ready to take off. How can science and innovation make it a sustainable and respectful with the planet? THE POTENTIAL of the maritime industry will hatch in the next ten years, according to the OECD. By 2030, wind farms at sea will generate a global business of 200,000 million euros and 435,000 full-time jobs. Thousands of oil rigs will go to scrap in the coming decades. With a part of its scrap, artificial reefs will be created where marine life will develop and next to it, fishing and aquaculture. A whole industry of billions of euros will flourish around the recycling of platforms. The development of new ballast water treatment systems for ships will form a market of 45,000 million euros. As for global aquaculture, it is growing since 2011 at a rate of 5% per year, and will be a business of 10 billion euros by 2030. Marine wind farms, reconversion of oil rigs, ballast water management and aquaculture are just four business of the new blue economy ready to take off as one of the most dynamic and innovative sectors of global capitalism in the next decade. The oceans will be vast deposits of resources where the new technologies that are already being developed will be applied and others will be invented to produce clean and inexhaustible energy, or to feed the population of the planet while respecting marine biodiversity. The nine European Union outermost regions are at the center of the emergence of the blue economy. Its 15 million square kilometers of sea form the largest Exclusive Economic Zone on the planet. Outermost regions have 20% of the world’s coral reefs and 70% of the European Union’s biodiversity. They offer all opportunities to innovate and thrive at sea, but also, present all the dangers of a blue gold rush that spreads out of control. The OECD postulates an approach to public policies of blue growth based on two pillars: innovation and sustainability. His report Rethinking Innovation for a Sustainable Ocean Economy was published this February 2019 in Paris with contributions from Plocan, the public consortium of ocean R&D based in the outermost region of the Canary Islands, and the Foundation for Science and Technology from Portugal, among the government agencies of different countries that have been consulted. The study — in short — formulates public policy criteria to address the dilemma of the ocean economy. The terms of the dilemma are the following: “On the one hand, marine resources are essential to meet the needs of the planet on food, energy, employment, medicine, transportation, etc. On the other hand, the increasing use of our seas and the natural resources they provide us adds enormous pressure to marine ecosystems “(page 15). The OECD proposes science and innovation as engines of sustainable growth in the maritime industries. Public policies and private activity must be guided by the available scientific knowledge and by technological solutions that are beneficial for growth and the environment. Organizing innovation in transnational cooperation networks, standardizing indicators of the blue economy, including an international method to measure the value of marine natural resources, and creating a satellite account dedicated to the ocean economy in the national accounts are some of the OECD Recommendations to Governments. On the advantages of having a specific satellite account, the report explains that this instrument would offer “a highly organized method of collecting consistent data on the ocean economy” (page 19). 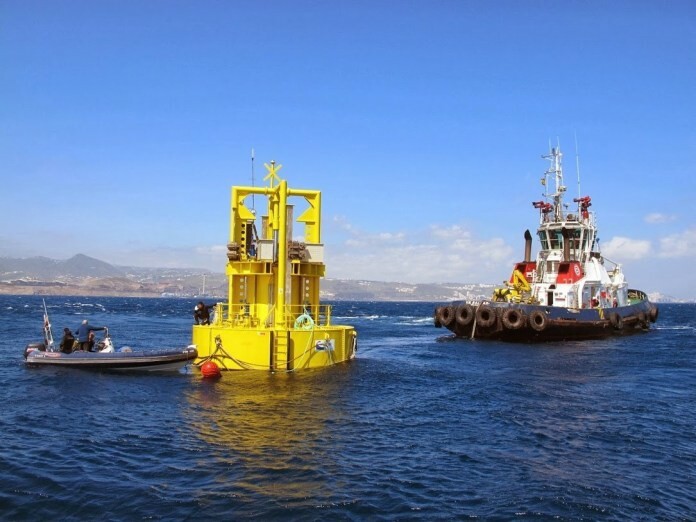 “Economic progress in ocean activities has to be sustainable for the environment,” says the report, which analyzes the innovative profile of four industries, offshore or offshore wind energy, scrapping and reconversion of oil and gas platforms. in artificial reefs, the management of ballast water and sediments of ships, and aquaculture. The examination of these cases “suggests that the innovations presented have the potential to boost an ocean economic activity that is sustainable, with possible positive impacts beyond the marine environment, although some of these activities face more challenges than others” ( page 18). With new materials, stronger, lighter and more durable structures of floating mills are being built. The satellites are being used to transmit data and images of the surface and ocean floor. The deployment of autonomous, submarine and surface vehicles, driven by remote control, helps to collect information and monitor the maintenance of the facilities. The analysis of big data gives meaning to the enormous amount of information generated by the maritime economy. Technologies that are driving efficiency and productivity in human activities in the ocean — from scientific research to shipbuilding, energy, fishing or tourism — include image sensors, satellites, materials technology, communications, big data, autonomous systems, biotechnology, nanotechnology, underwater engineering and other innovations. Experts note that marine ecosystems are still relatively unknown to science, and therefore, the approach of regulators to the blue economy must be made with caution: “A continuous effort is still needed to offer progress on both fronts, the scientific and the technological, in order to ensure solutions that favor both economic growth and environmental sustainability” (page 18). The report proposes strengthening national ocean observing systems and unifying methods of analysis. “Permanent observing systems are an essential part of global efforts to better understand the ocean and how it works” -says page 20. The OECD recognizes the ability of the blue economy to boost the growth of local economies. It exemplifies it in the development of maritime wind farms. A whole fabric of economic activity grows around it: port services, shipyards, installers. Another example is aquaculture, which “promises profits” for satellite sectors such as cleaner fish breeders, remote sensing providers or feed suppliers for fish. In total, the OECD indicates that the activities dependent on the nuclei of the blue economy generated 90,000 million euros in 2017 and estimated that they will reach 150,000 million in 2022. The report on innovation in the ocean economy assesses its benefits on the environment. The case of the floating wind farms is perhaps the most notorious: in 2015, the CO2 emissions in the electric production cycle generated by offshore mills ranged from 7 to 23 grams per kilowatt hour, while the generation emissions conventional gas plants were 500 grams, and 1,000 grams in coal plants. The ability to reduce CO2 emissions means that this technology also has a positive impact on “the ecosystems of the world’s oceans, indirectly contributing to lower levels of acidification, de-oxygenation, and temperatures and water levels,” says the OECD in its report (pages 28 and 29). In terms of aquaculture, offshore farms are more beneficial to the environment than coastal ones. The impact on water quality is reduced, the use of anti-microbial treatments is reduced and less stocks of fish and feed are used as food. Currently, offshore farms are in a very early stage of development, and there are very few in the world that operate on a commercial scale. Even so, the OECD highlights the growth potential of this sector: it estimates the area available to raise finfish for 11 million square kilometers, and 1.5 million kilometers for bivalves, enough to increase fish production to 15,000 million tons per year, “that is, 100 times the current level of consumption” in the world (page 28). Innovation applied to floating wind farms is one of the four activities analyzed by the OECD in its report on blue innovation. 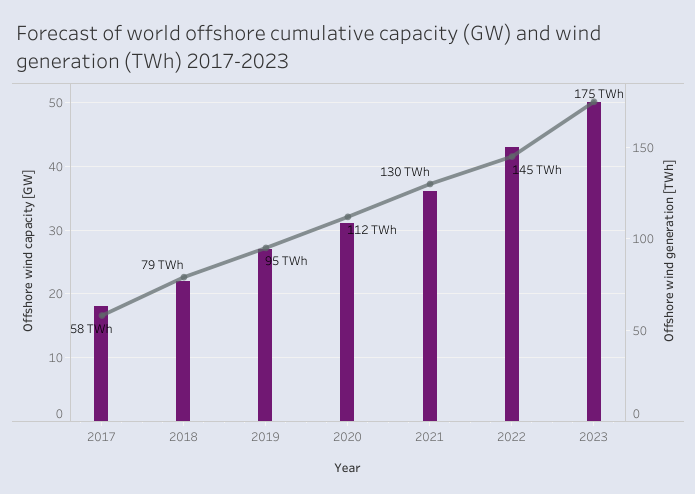 The trends in the sector are eloquent: twenty years ago, there was not one mill installed, in 2017 the total power in the world was 18 gigawatts and by 2023, the OECD expects that there will be 52.1 gigawatts installed in offshore mills. 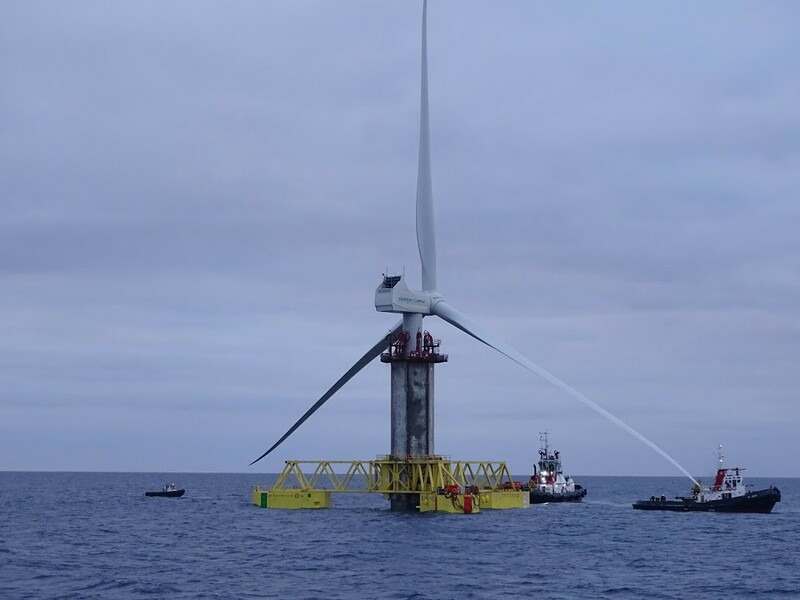 The added value generated by oceanic wind farms in the world will multiply by eight in 2030, and its weight in the blue economy will increase from the current 1% to 8%, according to the same international organization in its report.